Swiss artist, documentary filmmaker, and researcher Dr Adnan Hadzi has recently made Malta his home and can currently be found lecturing in interactive art at the University of Malta. He speaks to Teodor Reljic about how the information technology zeitgeist is spewing up some alarming developments, arguing that art may be our most appropriate bulwark against the onslaught of privacy invasion and the unsavoury aspects of artificial intelligence. What does art really ‘do’? Right. Let’s step back and give this loaded thought a good, proper, well… think. Does art have any other function beyond its simple—and often much-maligned—ability to allow us to escape the humdrum or unpleasant realities of life by offering us an aesthetic transport of some kind? And if we’re talking about art on the opposite side of the spectrum—the actively political, the openly provocative—is that stuff not better served by organising protests, by petitioning politicians, by running for office ourselves? Admittedly, this is a very crude characterisation of what art could potentially be and the kind of force it continues to radiate worldwide. But it’s also a handy crucible with which to preface my conversation with Dr Adnan Hadzi, a documentary filmmaker, transmedia artist, and now lecturer on interactive art (Department of Digital Arts, Faculty of Media and Knowledge Sciences, University of Malta). Hadzi cut his teeth on various art collectives around Europe. In London, he spent a sizeable amount of time in institutions like Goldsmiths University, where he rode a wave of collaboration with new media art collectives which, among other things, seek to eviscerate our relationship with omnipresent and ever-more invasive technology. What emerges from our conversation is just how much the very assumptions we tend to have about both art and the technological hegemony are in dire need of analysis, dissection, and meditation. It’s a discussion, however, that Hadzi fears we may be having ‘far too late, perhaps.’ The exponential growth of certain technologies we have invited into our lives may already have brought us to a point of no return. But if we stave off the doom and gloom, even for a little bit, we’re all likely to find that a better understanding of the evolving nature of the Internet would make us feel that little bit more aware, and that little bit more empowered. Hadzi’s work and research interests continue to fuel this strand of inquiry and creation. In parallel to his research focused on media ethics, Hadzi was a regular at the Deckspace Media Lab. There, he helped coordinate the Deptford.TV project. 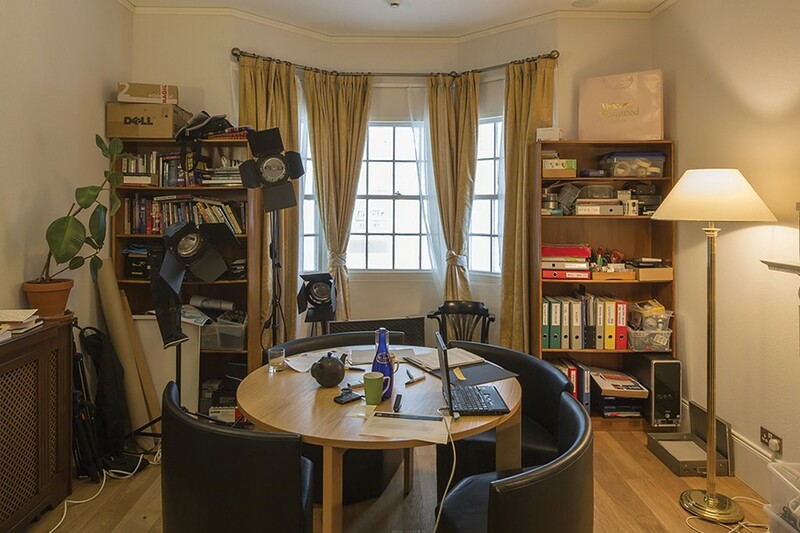 Together with his subsequent work on the Creeknet Project, Deptford.TV—accessible online—engages with the local community of Deptford in South London by creating an online ‘data hub’ of sorts. In short, it is a plea for both democratic accessibility of data and a general transparency about how that data is disseminated and consumed, filtered through processes that could be broadly described as new media art. ‘I believe that art has a very strong claim on these realities, and can create a very necessary discursive space which is sorely missing,’ Hadzi says, bringing up the tragicomic case of how the internal dynamics of complex algorithms—such as those which underpin our financial system—tend to be opaque even to those who operate them. It is an approach that is pushed to further refinement by one of Deptford.TV’s collaborators, the !Mediengruppe Bitnik collective. Hadzi has limited involvement with the collective, fully crediting the project’s founders, Domago Smoljo and Carmen Weisskopf, as its main driving force. Yet his close-to-the-bone involvement with the group makes him an astute commentator on the implications of their work. Operating between Zurich and London, the collective has initiated a wide variety of projects, installations, and artistic ‘happenings’. All of them share one thing in common: their engagement with contemporary information technologies. Among the most prominent was certainly Delivery for Mr Assange. 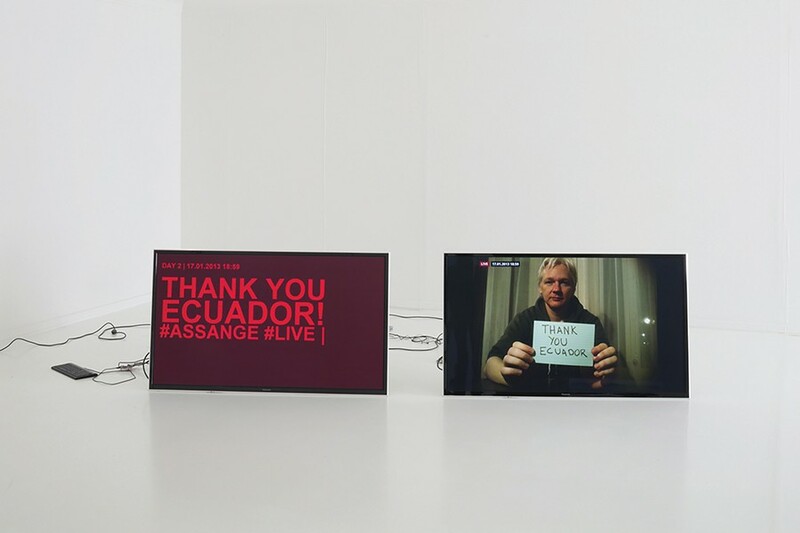 The live video project documented the journey of a package sent by post to Wikileaks founder Julian Assange, famously exiled within the Ecuadorian embassy’s confines in London. Beyond the attention-grabbing effect of featuring Assange himself—’of course this added a political currency to the initiative,’ Hadzi says—the main aim of the project was really to delve into notions of privacy. The simple, picaresque journey of the little package, and the small camera that had been snuck into it to stream its travels live on Twitter, successfully undermined the privacy of all involved. ‘The postal workers who were filmed wrapping and delivering the package, they have their own private spaces and their own rights too,’ Hadzi notes, rights which were compromised by the recording device which captured them as the package headed to its celebrity recipient. However, Hadzi is also quick to note that the operations of the collective are entirely legal, suggesting that this is somewhat part of the problem. If such a ubiquitous use of surveillance technology is perfectly fine with the authorities, then critiquing it becomes even more urgent. ‘Indeed, the collective has very strong ties with media law and ethics experts, and they have fact-checkers in place to ensure that nothing they do crosses any clear legal lines,’ Hadzi adds. But the nature of the beast is that these lines tend to be murky. 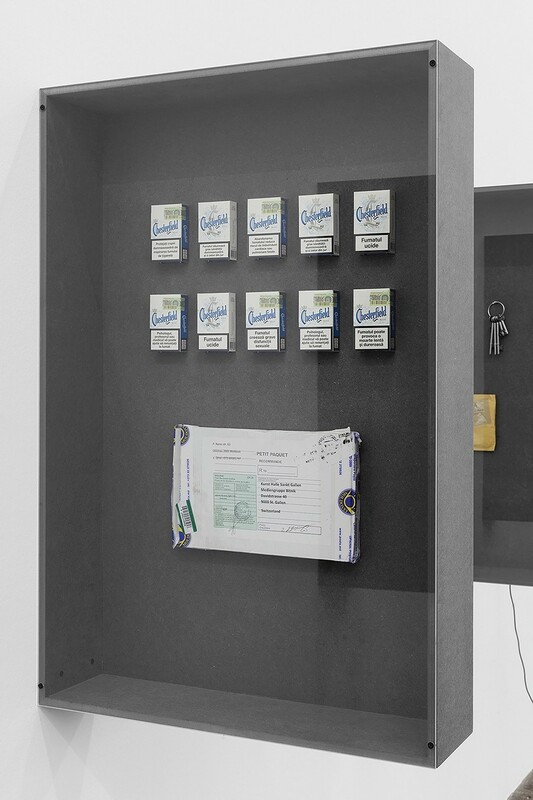 An explicit case is the collective’s 2014–2016 experiment, Random Darknet Shopper. As the title already suggests, the project involved a custom-made algorithm sent out into the ‘Dark Web‘ (the Internet’s black market) with a budget to purchase stuff at random. 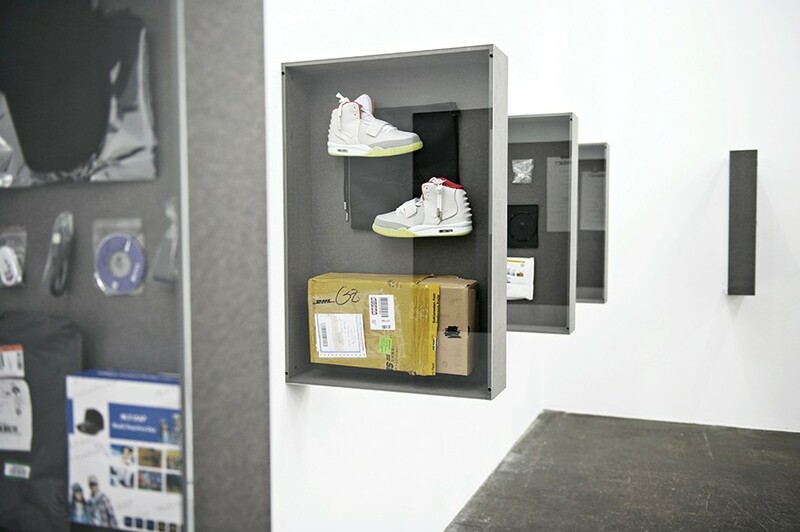 As was eventually displayed in an installation based on the intervention at the Kunst Halle Sankt Gallen, Switzerland, a lot of the algorithm’s $100 Bitcoin budget went to relatively harmless purchases. But the randomised system also ended up buying a pack of ten yellow ecstasy pills. ‘This of course brings up the question of whether a pre-programmed but randomly operating system can be held responsible for committing crimes,’ Hadzi observes. In fact, the artists were eventually cleared of any charges, precisely because the public prosecutor believed that the project raised questions that are of public interest. The idea of machine learning is an urgent concern for Hadzi and one that he believes should be addressed sooner rather than later. It may be an alarming point, but it’s also yet another argument for art to be allowed to do its work with full autonomy–never averting its gaze from contemporary realities and technological developments, while also refusing to ‘ingest’ them without questioning their implications. Now that he’s settled in Malta, I find myself asking whether Hadzi deems the island an interesting space from which one can continue to observe these multidisciplinary—and highly topical—intersections. Among other projects, Hadzi also looks forward to helping create an ‘immersive pipeline’ in Malta, a space for all people to discuss pressing matters related to privacy, surveillance, and artificial intelligence in a welcoming space that acknowledges the problems but doesn’t shy away from them. Being immersed in the heady and uncertain world can do one’s head in. Having spent some years operating from a boat on the British Waterways, Hadzi and his partner have just moved from the bustle of Mosta into the comparatively sedate enclosure of Fontana, Gozo, and that feels somewhat relevant to our discussion. But ignoring these dynamics will not assuage our anxiety. Instead of endless polemics, let’s process it through art. Up, up and away! The time for contemporary art is now!